Last year, over 30,000 developers began their amazing journey into the world of bots. Mobile app developers experimented, tried, failed, succeeded and some even learned a lot about natural language processing as well as machine language. However, bots didn’t become the highly popular thing in the year 2016, but this was completely fine with all developers because they know that iPhone apps didn’t became popular overnight. However, this will be the most amazing technology advancement that will be seen in homes in the year 2017. Amazon.com’s Echo and Google Home are known as amazing bots that talk to their users via speakers and it is believed that their built-in microphones can hear from across a room. Talking about Echo, when it hears the name Alexa, the LED of the product rings light up in the direction of the user, which shows that it is listening. The best thing is that it answers questions, plays music, effectively orders products and even tell jokes. On the other hand, Google Home can communicate with Google Pixel and the Pixel XL. These are the first two smartphones that are equipped with a built-in Google Assistant. It can also easily manage Google accounts, read and write mails as well as keep track of notes and calendars. In addition, the device effectively leverages Google’s knowledge graph that contains numerous facts about people, things and places. Due to this, the device provide responses to questions which is far beyond the capabilities of other voice controlled apps as well as devices. It supports YouTube Music and Google Play Music. Both Google and Amazon have opened up their devices to third-party developers. You can expect to see these bots connected to fitness devices and thus, people will be able to devise better exercise regiments. The best thing is that it looks like a piece of furniture that can be easily customized to suit your decor. Now, everyone will be able to talk to the machines that seems natural. Such technology can easily respond to font instructions as well as query quickly. Thus, if you are engaged in a business where there is a need to handle a lot of questions or queries then bot is the best option for you. This is because this technology can give answers to your questions at a rapid pace in comparison to a customer service representative. In other words, this is how machines and humans learn. Hence, tech industry is rushing to get its bots into the market and to make it affordable for everyone, the cost is $150 or even much lesser than this. There is no denying that when the more devices will be in use, the more they will be able to learn and the technology will get much more smarter. As per experts, bots listen to everything that is happening in your house and this way they learn how residents think, live, work as well as play. This paves the dark side of this technology. It gathers massive amount of data about people and this puts privacy at risk. However, neither Google nor Amazon is coming forward about the usage of data that it collects and not telling about the precautionary measures so that hackers cannot accomplish in their mission. Successful case studies say that bots will become much more efficient as well as useful with single passing day and it is believed that when a tech giant is investing in the space then this is the tipping point for bots and will drastically change the way businesses interact with customers. Hence, there is no exaggeration in saying that undoubtedly, 2017 is the year of bots. Appinventiv is a pioneering company on mobile app development which believes in building quality apps, at the right time. They have assumed a leadership position in the mobility space, within a short duration of time, using the latest technologies. 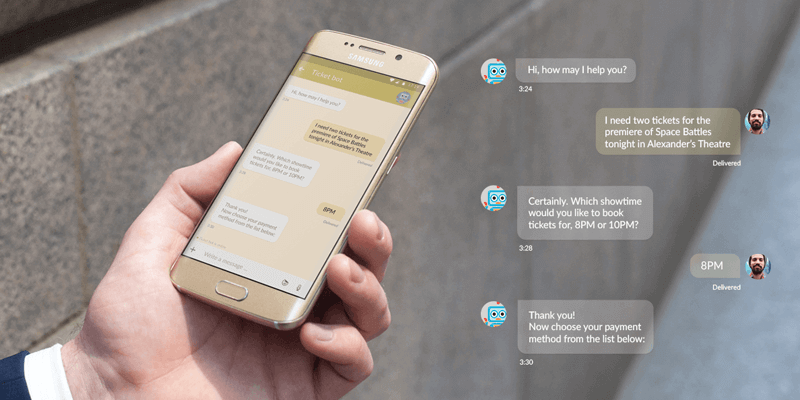 “How Much Does it Cost to Develop A Chatbot,�?